This is one of those off-the-wall recipes that just leaves you scratching your head and asking yourself, "But... why?" I don't know how original it is, but I had a brainstorm the other day and just went with it. When it was all said and done, I found myself thinking that this would be a great dinner dish for a kid's party or sleepover (if you're a dad who has girls, make a motel reservation first). 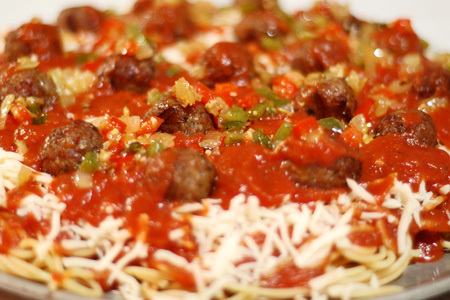 It's basically just a funky version of spaghetti and meatballs, and kids generally dig funky. 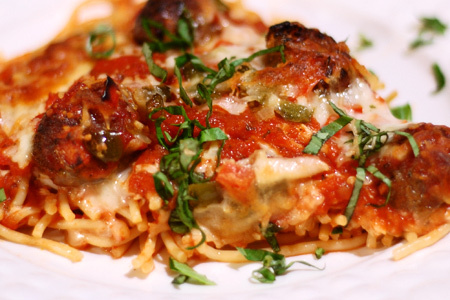 The meatballs in this recipe aren't really "meatballs" in the traditional sense. 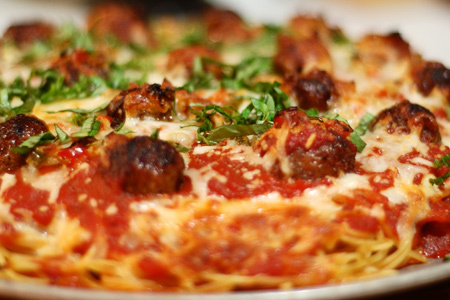 I was shooting for quick and relatively easy, so I just went with straight Italian sausage. Hey, that's all they put on pizza anyhow. Note: You will also need a large metal pizza pan and some parchment paper. Cook the spaghetti per the package directions until it is just overdone (not al dente), drain in a colander and let cool 20 minutes, tossing occasionally. 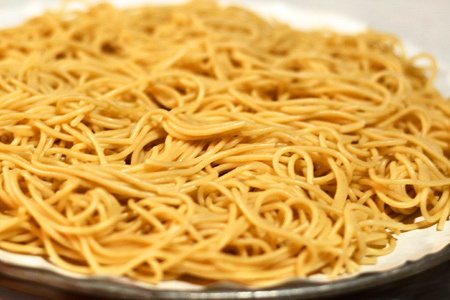 Important: Do not rinse or add oil to the pasta. You need the starch to help it set. Cut a piece of parchment paper to cover the pizza pan completely. 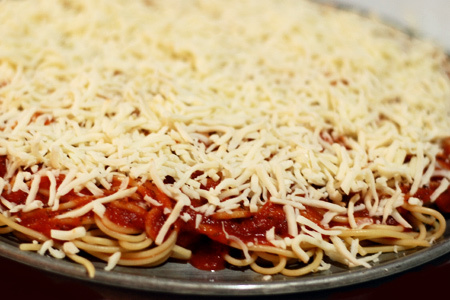 Place the spaghetti on the parchment-covered pizza pan and arrange it in an even layer as shown. Refrigerate the pan for an hour or two to let the pasta set. To make the "meatballs", squeeze the sausage out of each link from each end, 1/4 at a time and roll gently in your hands to form small balls (the casing does most of the work). Each link should make four balls. Set the balls aside. Heat a large skillet over medium heat then add a little oil. Saute the meatballs until they are just browned on all sides, remove to a plate and set aside. Return the pan to the heat and add a little more oil. Season the peppers and onions with a little salt and pepper then saute them until they are just tender. Set the pan aside. Slide the parchment off of the pizza pan and oil the pan lightly. Flip the spaghetti over onto the pizza pan and discard the parchment paper. 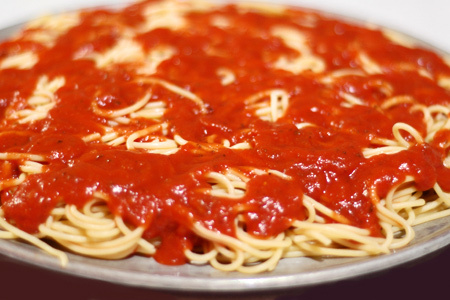 Spread the spaghetti sauce evenly over the top of the spaghetti as shown. Sprinkle the cheese evenly over the sauce. Slice about 10 of the meatballs in half and distribute the halves evenly over the cheese as shown. You will have some meatballs leftover. Distribute the sauteed vegetables evenly over the cheese as shown. Sprinkle the basil over the top. Bake the pizza for 30 minutes. Let the pizza cool for about 10 minutes. Slice into wedges, serve and enjoy! Great moment of genius! 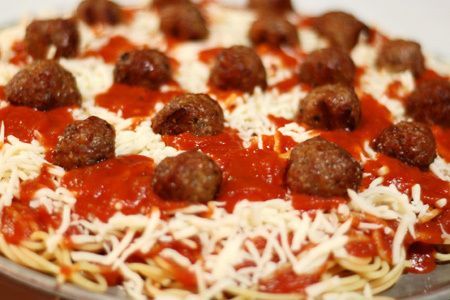 I have done the "cheating meatball" that you did and it does work great, but I really like this whole spaghetti pizza deal. Going to stop by the restaurant supply store near work tomorrow to pick up a metal pan, all I have is stones. Can't wait to try this on the Egg this week. Great post. 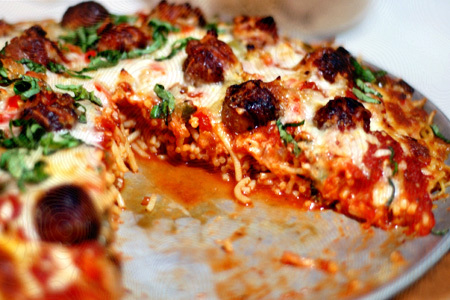 Did this for dinner tonight ... Spaghetti & Meatballs Pizza isn't just for kids. Easy and filling a fun meal. Thanks John! I'm glad y'all enjoyed it. It was a fun recipe. This looks like an easier version of my Upside-Down Fettuccine Bake. Kids love whenever food isn't in its usual and expected form. I know this is a really late comment but, this is right up there with spaghetti tacos. If you bake it at 450 and put the sausage on there raw it crisps up really really nice. Just FYI. I make pizza out of everything. And every time high heat is a must.